Whole Wheat Bran Muffins with Figs and Pecans - Do You Know The Muffin Man? Notes: The batter was quite liquid when I finished mixing it, but I let it sit for about 5 minutes as I knew the oat bran would absorb the excess moisture. 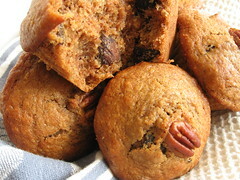 These muffins were delicious, a smooth texture with yummy dried fruit and nut. My only criticism is the abundance of leavener; I used soured milk instead of buttermilk, so maybe it wasn't acidic enough to balance all the baking powder and soda.